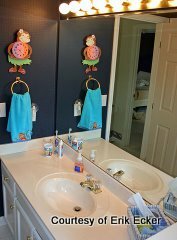 Choosing paint colors for bathrooms. functional and fun for your babies. Parents and their babies spend a lot of time together in the bathroom. Coming up with a decor that they’ll both enjoy is a challenge but not impossible. 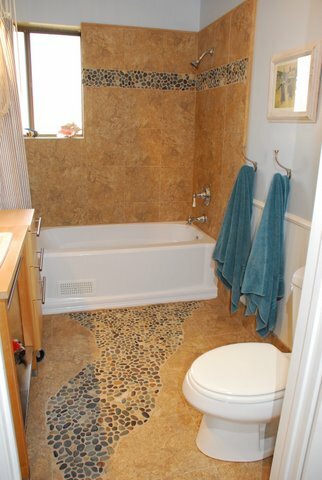 Selecting the right colors and furnishings can turn blah bathrooms into fun, beautiful bathrooms. There’s a bit of psychology involved when selecting paint colors for bathrooms. Colors can affect mood – both yours and your baby’s – and can either promote calm, or incite rowdy erratic behavior. Kids are naturally drawn to bright colors; they stimulate their developmental processes. However, psychological studies have shown that when entire rooms are painted in bright reds and yellows, our little darlings are more apt to show anger and frustration - crying, angry babies usually translates into frustrated parents - so opt for using the bright colors in accessories and bath toys and not on the walls. Cream colors like ivory and taupe, and soft grays make wonderful pallets upon which to build. If you’re decorating for a girl, pink accessories blend beautifully with either cream or soft gray. Blue for the boys really pops when combined with ivory or taupe. There’s usually a lot of clutter that goes along with babies – diapers, wet naps, changing tables and of course, mountains of bath toys. 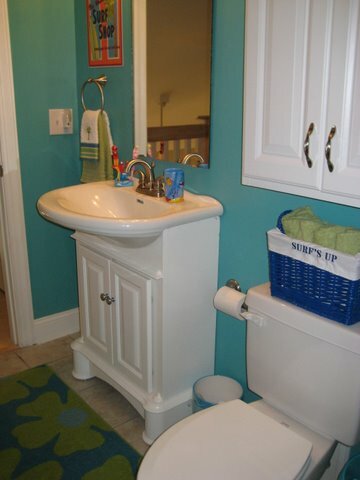 Organization is the key to maximizing space when decorating small bathrooms. Keep them in colored plastic baskets or boxes and stored on shelves in the bathroom linen closet for a neat appearance. This is a great way to help teach your toddler his colors by making a game out of where ‘Mr. Soap’ is hiding – in the blue basket or the red one? 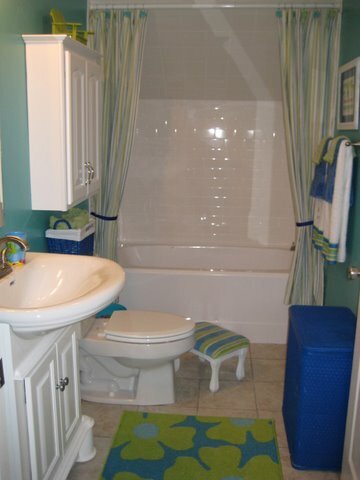 Replace those see-thru glass tub and shower doors with a shower curtain; glass doors and wiggly kids are not compatible, plus, bath toys can be stored out of site in net sacks behind a cool themed shower curtain. 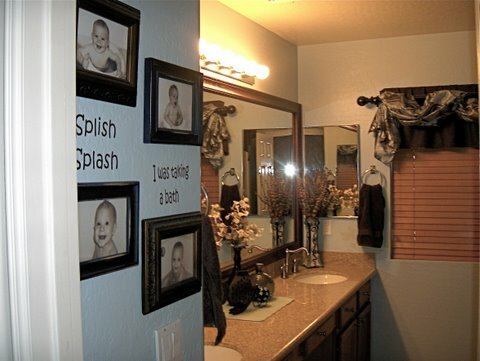 You don’t have to skimp on safety features when creating beautiful bathrooms for babies. Safety items are top priority for manufacturers who specialize in merchandise to help keep your precious little bundle safe. These mats come in all shapes, sizes, colors and themes that blend right into the bathroom décor; no-one but you will know they’re safety precautions. Little fingers and toes can get caught in drains and curious hands can accidentally turn on the hot water. A quick online search will turn up a host of themed covers made of inflatable vinyl that slip over protruding faucets. Clamp-cover for the toilet seat. Not only is the toilet a potential drowning hazard, it can be the recipient of toys or other articles that might be thrown in by a playful youngster. Place child-proof locks on all cabinet doors where liquids, medicines and electrical appliances are stored. This device beeps to alert you when your child has gone into the bathroom. Some of them have LED lights that flash and beep – a cool safety device that’s toddlers love. Sponge puzzles are great for teaching colors and shapes. Use the different pieces for washing different body parts; i.e., blue for the face, red for the hands. Go ‘fishing.’ Give him a net with a plastic handle to go ‘fishing’ for toys. This is great for teaching coordination. Use a kitchen timer or plastic hourglass to put a time limit on finding submerged toys. Several companies manufacture bath crayons and paints and what better place to let your toddler explore his creative side than in the tub where clean-up is easy. But instead of letting him paint on the walls, get a waterproof board that will sit across his lap. Standing in a slippery tub to paint on walls could result in a fall. Place posters with their favorite characters on the ceiling and play ‘I spy.’ Rinsing shampoo out of the hair will then become a game because they’ll have a distraction. Remember, even though you’re creating beautiful bathrooms that are functional and fun, never leave your baby or toddler alone in the bathroom.